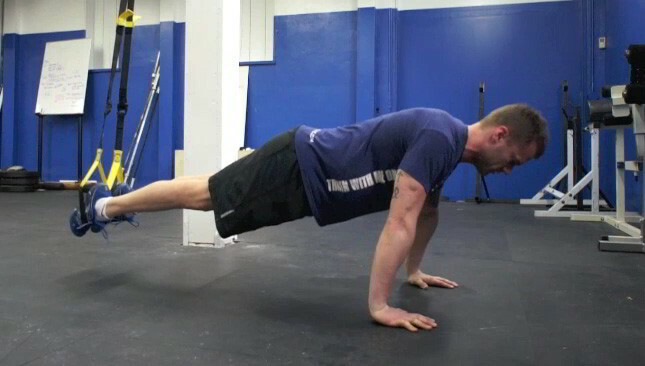 The most beneficial of all upper-body pushing exercises are push-ups! They are extremely effective for increasing upper body strength, particularly for the chest, shoulders, triceps and core. Once an individual learns how to properly perform a push-up and becomes strong with them, the basic move no longer provides adequate stimulus for improvement. To build strength and develop a tight and toned upper body and core, look no further than the push-up. The push-up requires no gym membership, no fancy equipment and is an effective exercise for everyone. With this one simple exercise, you’ll work several different muscle groups and you can continue to increase the difficulty of the exercise as you get stronger. You can even work push ups into a quick high-intensity routine for calorie-burning if weight loss is your goal. To keep challenging the body, force it to adapt and change! Here are five variations that will take your fitness to the next level. This push-up variation can be used in place of an incline bench press, but is particularly helpful for those who have difficulty pressing overhead. By elevating the feet in a push-up helps transfer the load toward the upper chest and anterior deltoids. Get in a push-up position, but instead of leaving your feet on the ground, place them on an object that’s about one foot high. Lower your chest towards the ground, keeping your forearms vertical. Push yourself back to the start position. Using a Val-slide under each hand puts an extra emphasis on the core, the first area that tends to give out once fatigue sets in. The benefit of working more muscle fibres in the chest, shoulders and triceps. 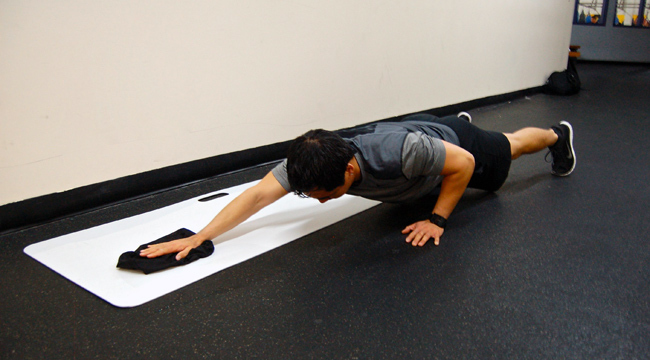 Place a Val-slide under each hand in a push-up position. 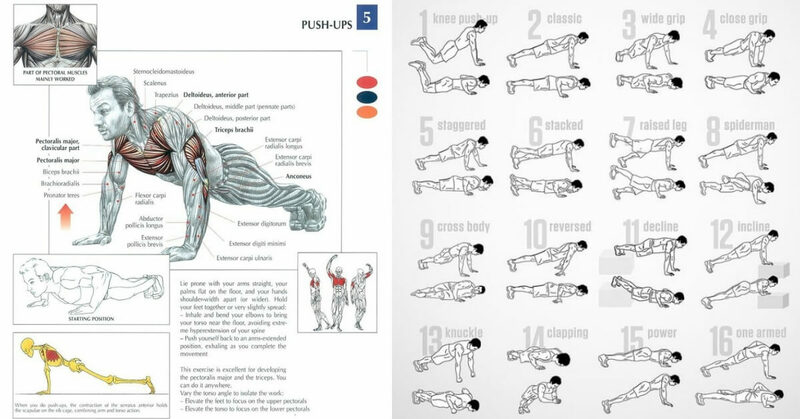 Begin to perform a push-up, and as you lower your chest towards the ground, slide one of your hands out in front of your body, keeping the extended arm straight, until your chest almost touches the ground. Push both hands into the ground and squeeze your abs to return to the start position. Repeat in an alternating fashion until all prescribed reps are completed. Reps: 5 each side. 10 total. For those who already have a strong core, the weak point of push-up may be the prime movers, or in the case of the push-up, the chest, shoulders and triceps. Set up a TRX or any suspension trainer hanging from a sturdy object so the handles are shoulder-width apart, about 12-18 inches off the ground. Hold onto the handles and extend your legs behind you in a push-up position. Lower your chest towards the ground, keeping your forearms perpendicular to the floor, until your chest is in line with your hands, then push yourself back to the start position. Push-ups can improve stability and strength. Try a puncher’s push-up, a naturally plyometric move that can be effective for those seeking to increase power. Take a firm medicine ball and place it under one hand in a push-up position with your feet spread wider than hip-width apart and core tight. Perform a push-up, exploding upwards so that the hand on the ground comes off the floor and lines up with the hand on the medicine ball. Pause for a second, then lower yourself back to the ground. Reps: 4 on each side. Test your strength, balance and coordination by placing a stability ball under your hands. This is an effective variation for increasing shoulder and core stability while simultaneously training the chest. Place a stability ball under your hands and squeeze the ball. Keeping your forearms perpendicular to the floor, lower your chest so it lightly touches the ball, and return to the start position.